And yet again, the list of books that I plan to read grows even larger. This was an enjoyable read, about what I imagine is an even more enjoyable read. The mention of manic depression made me remember the two-part television documentary about that specific disorder, hosted by none other than Stephen Fry. He opened the first part with the story of his own condition. 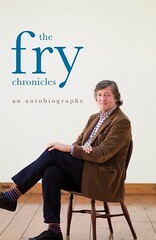 I think that was the first time I realised how uniquely exeptional Stephen Fry is as a teller of stories. And now I start thinking, do we have any similar personalities in Norway. As for a term for «the very strange feeling you get when you see pictures of someone from a time before they were presented to you, before they are fully formed», can it be seen as a sort of modern nostalgia? One that is made possible due to the immensly increased availability of photographs? It's not quite a homesickness or a longing for your own memories past. It's more of a recognition of the passing of time in general, and a mild recognition of the fact that other people and objects also changed with time. And for such a feeling to occur or be instilled, one could be tempted to believe that you would have to be familiar wih the feeling of nostalgia. In a way, it is a sort of nostalgia, but one that doesn't demand a direct connection to the source of the feeling. Instead of bringing you back in time, it inflicts a certain feeling of knowing something or realising something about the past that you previously didn't have access to, or didn't acknowledge consciously. Wow. I'm blathering on here. Maybe the greek word for «the past» (parelthos?) + the word for realisation? Adresseavisen vet hva de snakker om: Stephen Fry omtales som komikeren som spilte katten i Tim Burtons film Alice i Eventyrland, og leder av flere tv-program, deriblant «komiprogrammet som er forkortet IQ» (sic!). Bwuahaha! Hurra for research! Jeg lurer på om det er en cupertino eller om det bare er snakk om ignoranse. Cupertino. Et fenomen jeg ikke har hørt om før nå, men det gir jo mening at den type feil oppstår. Vittig er det i alle fall, men jeg tror heller at det i dette tilfellet er snakk om ordinær hverdagsignoranse. Stephen Fry kommenterte et eller annet sted at han av og til møtte folk på gaten som sa at de var kjempestore fan av nettop IQ[sic]. Jeg lurer på om vi kan få Tim med sin gresk-kompetanse til å konstruere et ord for den formen for moderne nostalgi du snakker om. Det er en veldig god beskrivelse, tror jeg. Oi. Ja. Det synes jeg vi burde.